Merry Christmas! Although I don't suppose many of you are reading this on Christmas Day itself that is when this will upload itself. For me writing this it's Christmas Eve (or Boxing Day Eve Eve if you are comedically inclined) and I'm trying out something I've been saving for a special occasion. 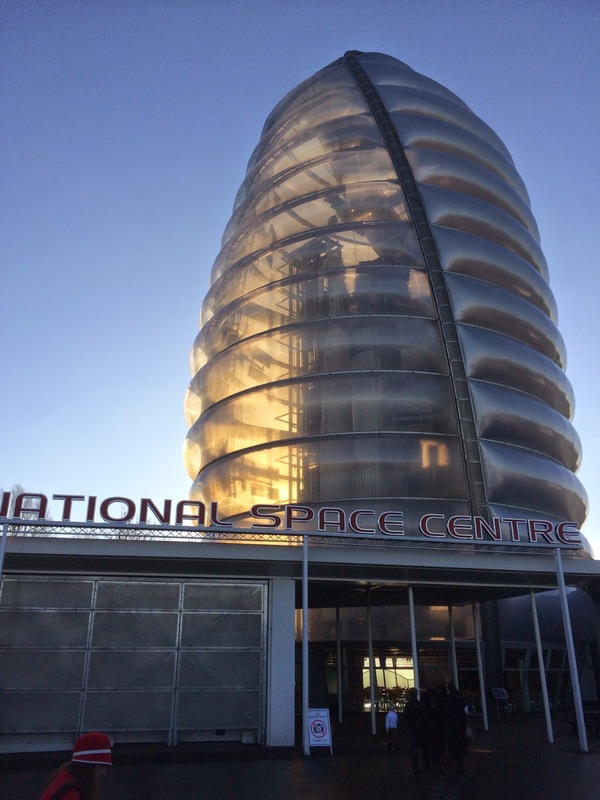 When we were at the Leicester Space Centre Steam-Punk weekend we picked up three things. 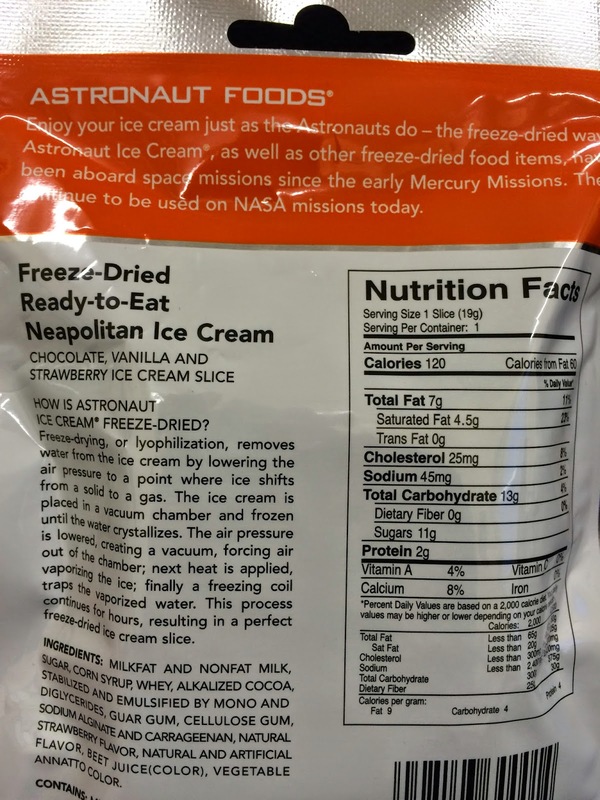 The first (strawberry Chocolate) was a little disappointing, the second (Freeze Dried Space Apples) was a tiny portion but fantastic. 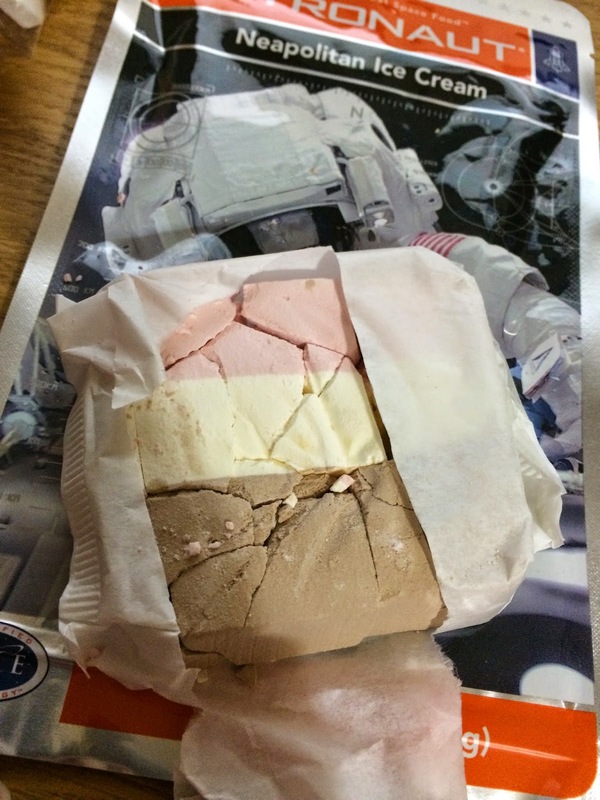 Here we have the astronauts dessert - freeze dried neapolitan ice cream. I chose this as it'd have three flavours instead of the just one that the ice-cream sandwich option promised. The first thing to note that it's all very well packed. While it's crumbled with me carrying it from place to place the inner bag has kept the chunks in the right places. It looks like those alphabet sweets that I love (powdery hard candy) but also like a block of ice cream. Maybe it has an air of fudge or nougat to the appearance too. Only it's hard, dry and room temperature. It's hard to describe just how odd room temperature solid ice cream is. It's a whole new confectionary. It's sweet, but not too sweet, and it's very crumbly but becomes almost chewy once you bite it. I guess it's re-absorbing the moisture as you chew. The first flavour is the red, which is a strawberry milkshake kind of affair. It tastes authentic and once you get over the lack of cold sensation is pretty nice. It's almost a honeycomb texture with the flavour of ice cream instead of sugar. The middle white stripe is a strong vanilla and as you can eat bits of just one colour (harder with real ice-cream) it's more noticeable in the mix. It's the least potent of the three but still rather moreish. The chocolate is also pretty good, while it's not freeze dried Ben & Jerry's it's certainly a good quality ice cream to start with before the science happened. I think that I expected it to be a stronger chocolate, but the creaminess works in its favour. When choosing desserts I'd always choose apple over ice-cream (heck - or both together) and here is no exception, but the portion size here makes it easier to recommend. I know that the UK prices of these are more than the company sells them for in the USA but even then the 'experience value' for this is much higher. If this was available as a small bag of cubes of the three flavours it would be very popular (this actually exists - see the end). The portion you get here is almost too much - for one person in one sitting anyway. It's perfect for sharing though so I'll pack up any that survive and take it with me to my family Christmas dinner which I'll probably be having as the post uploads. Hope you have had a merry christmas too - and if you got any odd food related presents you want to mention to us then feel free to mention them in the comments or find us on Facebook to say. 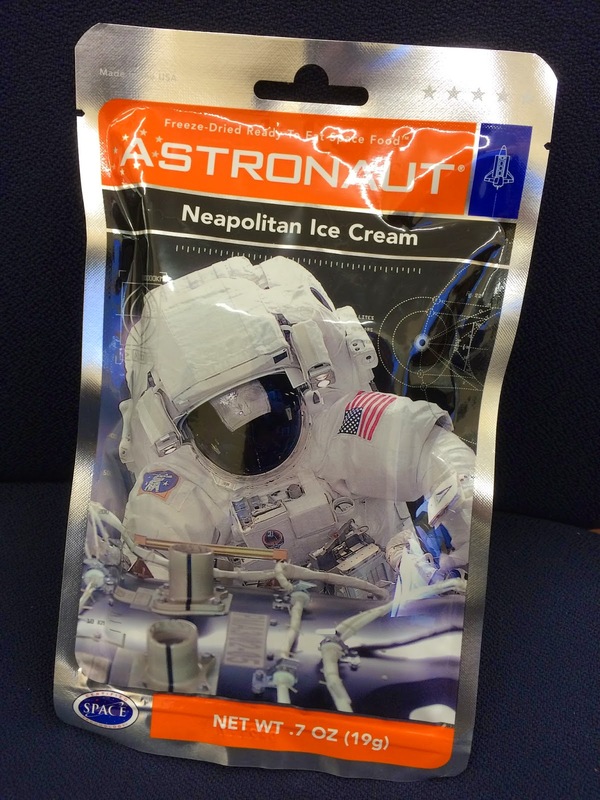 Find more by this company at www.astronautfoods.com - including the ice cream drops that I just described above - must be a common idea! In a big resealable tube these are more of a sharing size thing or for watching space films or wandering around a museum.